Won’t you be my urchin? The vegetarian sea urchin Diadema antillarum. Imagine you are snorkeling on a coral reef where you can see many species living together. Some animals, like sharks, are predators that eat other animals. Other species, like anemones and the fish that live in them, are mutualists and protect each other from predators. 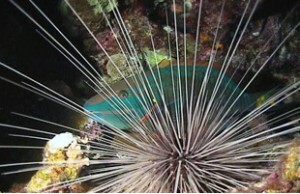 There are also herbivores, like urchins, that eat plants and algae on the reef. All of these species, and many more, need the coral reef to survive. Experimental setup with tiles in bins. Some bins have sea urchins and some do not. Corals are the animals that build coral reefs. They are very sensitive and can be hurt by human activity, like boating and pollution. Corals reef ecosystems are also in danger from warming waters due to climate change. Sadly, today many coral reefs around the world are dying because the places they grow are changing. Sarah is a marine biologist who is determined to figure out ways to save coral reefs. Sarah wants to understand how to help the dying corals so they can keep building the important and diverse coral reef habitats. Corals compete with large types of algae, like seaweed, for space to grow on the reef. Corals are picky and only like to live in certain places. If there is too much algae, corals will have no place to attach and grow. Sea urchins are important herbivores and one of the species that like to eat algae. Sarah thought that when urchins are present on the reef, corals will have less competition from algae for space, and thus more room to grow. Maybe adding urchins to a coral reef is a way to help corals! To test her idea Sarah set up an experiment. She set 8 bins out on the reef. Into half of the bins, Sarah added urchins. Into the other half she left without urchins as a control. Sarah put tiles into all of the bins. Tiles gave an empty space for coral and algae to compete and grow. After a few months, Sarah looked at the tiles. She counted how many corals were growing on each tile. 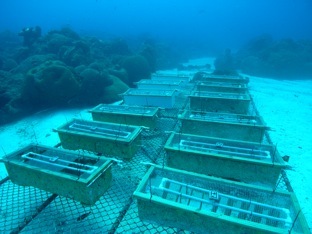 Sarah predicted that more corals would grow on the tiles in bins with sea urchins compared to the control bins with no sea urchins. B. Photograph of coral species Agaricia juvenile on experimental tile. C. Photograph of coral species Porites juvenile on experimental tile. There is one scientific paper associated with the research in this Data Nugget. The citation and PDF of the paper is below. After students have completed the Data Nugget, you can have them discuss the management implications of this research. Watch the news story below and have students consider how urchins can be used as a management tool to help restore coral reefs!